What!! You already know them? Well, we would expect nothing less… but allow us to share a little more insider knowledge straight from the mouth of the main man, Travis Blue.These bad boys are all over the globe but the Palm Springs location is the one we dream of visiting most and the Ace crowd have a fond love of our roundie so we know we'd have a ball! This hotel is the crux of cool situated on the corner of radical & fabulous highway it is also amidst the Coachella festival stomping grounds and a stones throw from LA LA land & Vegas! How would you describe Ace Hotel? Ace Hotel is a soul-seeking son of a b. We look for the possibility of joy in a space, and attempt to reimagine how a hotel can engage with its community. Ours is a world designed for curious travelers, academics and adventures to come and sleep, dance, work, fall in love, learn a lesson, live the way you feel it. We're just trying to make places that we want to hang out at. What do you love most about the communities you are in...? Our communities have spirit. They are vibrant, rich, colorful worlds that remind us of the humanity present in a moment, on a sidewalk or from the window of a zooming taxi cab. We like costume parties. We love piñatas. Favorite beach and how you enjoy it? La calanques de Cassis, with cheese and poetry. What's inspiring your team at the moment? We are inspired by folklore, science, magic and gifts. 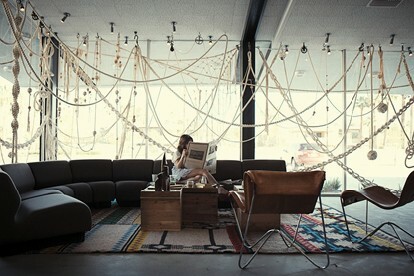 Thanks for stopping by zee blog Ace Hotel! 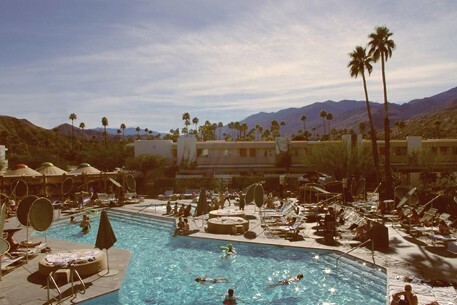 Now if only we could stop by Palm Springs and have a dip in that pool…..ahhhh life would be complete! !